Mukhtar Hussain is serving as the Security Officer for CIVIC in Afghanistan. Mukhtar has worked with number of international INGO and UN organizations for over 13 years. Mukhtar worked as Security Officer with the Security Department of United Nations in Bamyan from 2005 to 2007. From November 2007 to December 2014 Mukhtar worked with INSO office in Kabul as a Regional Safety Advisor. From August 2015 until February 2016, Mukhtar worked as Security Manager with HELVETAS, Swiss INGO. 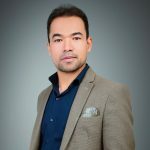 Afterward, from 15 February 2016 until June 2018, Mukhtar worked with Mission East INGO in Kabul as a Safety/Security Manager. Mukhtar obtained a Master Degree (LLM) in International Law from Kateb University in 2015. In 2013, he completed a bachelor degree in Judiciary and Attorney (L.L.B) from Kateb University. Additionally, Mukhtar obtained a Diploma from Hong Kong University in personal dispute resolution (Arbitration) in March 2016.